Junior Emma DeWitt embraces the holiday season with her collection of themed objects and clothes. Most everybody loves the holiday season, full of gifts, kindness and joy, but does anyone enjoy it more than junior Emma DeWitt? Although she said she doesn’t participate in the religious aspect of the season, DeWitt said it is more than just that to her. “I really like the spirit of the holiday. I like dressing up in Christmas sweaters and playing in the snow,” DeWitt said. She said buying and wearing Christmas sweaters is what got her obsessed with everything Christmas. 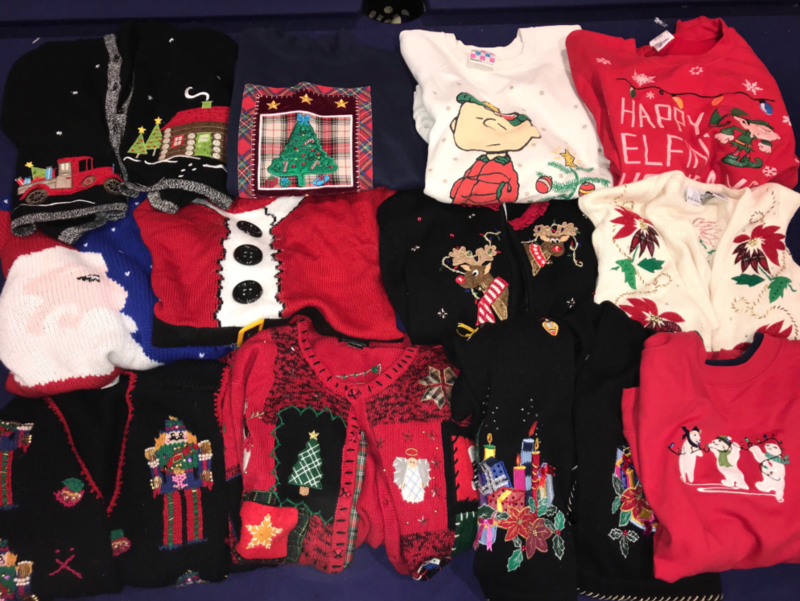 “One year for our Christmas card, we all dressed in Christmas sweaters, and since then I’ve been going to Goodwill to find more and more. I have Christmas sweaters for every weekday of December. I wear one Christmas sweater on Nov. 1, and this year I wore one on Oct. 1. Even though I got ridiculed, I just blocked out the haters,” DeWitt said. The people around her don’t always agree to that. “My family thinks I’m a little bit weird when it comes to my love of Christmas, but when the holiday season does come around, they get much more into the spirit,” she said. Even though they aren’t as obsessed with the holiday as she is, DeWitt said that they always make time to put up their biggest Christmas tree together as a family. Even though each year her family watches ‘A Christmas Story,’ it is not her favorite Christmas movie. She said that her favorite is truly “Elf.” She said that it is her favorite because it is so funny.